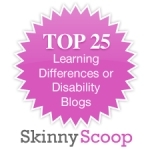 PLEASE HELP: My blog has been nominated to be on Skinny Scoop’s Top 25 Blog List for Learning Differences or Learning Disability blogs that help parents & their children navigate success in learning!! To vote please look for Bryce’s picture and click on the “+” to vote! Only have til the end of the month.